Traditionally, adaptive welding robots have been used to handle low skill, repetitive tasks from a fixed location. But with the tools and features available today for offline programming, sensing, tool changing, and remote monitoring, robotic systems are gaining the flexibility and technology needed to widen the range of capabilities. This is particularly useful when the welding requirements involve extremely large metal parts located in a dangerous environment. 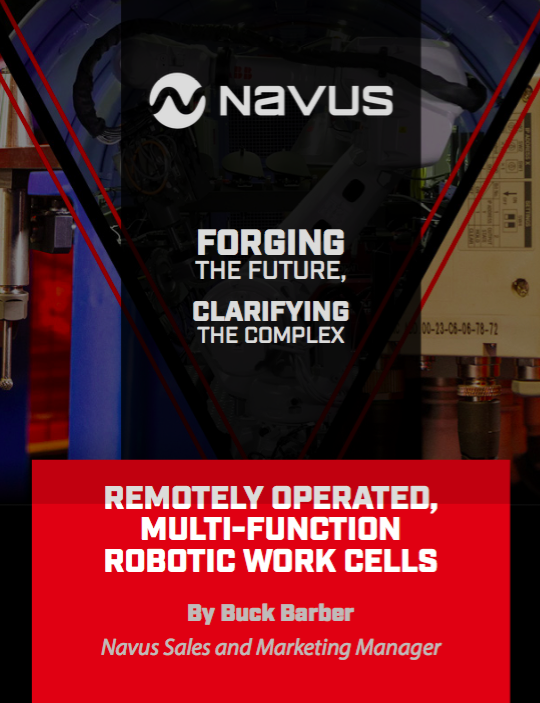 The unprecedented Navus system featured in this free white paper, Engineering The Future With Remotely Operated, Multi-Function Robotic Work Cells, moves the robotic welding workcell 100-feet into position in a dangerous environment while the operator works remotely from a safe location. The multi-task robot effectively preps joints, welds, provides inter-pass cleaning, and vacuums welds remotely. By drastically reducing operator risk and increasing productivity with multi-function robotics, Navus’ system substantially reduces the prohibitive costs of time and expense of traditional methods required to achieve this vital task. Saves money and time by bringing weld cell to part. Reduces safety risk of harsh work environment with remote operation. Saves time by eliminating need for operator rotations every 15 minutes. Reduces quality risks of weld inclusions with use of 1 operator. 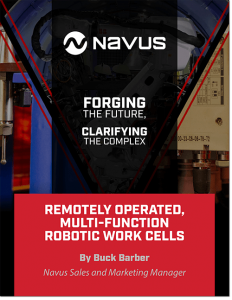 To learn how this Navus system is forging the future for multi-task, remotely operated welds, read the free white paper, Engineering The Future With Remotely Operated, Multi-Function Robotic Work Cells, by clicking here to download. Founded in 1998, Navus Automation, Inc. is an industry leader in full-service custom machine building, welding, and integration solutions. We collaborate with many Fortune 500 companies in the automotive, military, agriculture, and consumer industries. Navus engineers provide exceptional robotic solutions for integrated systems that increase productivity, quality, and safety. Contact us online or call us toll free at 1 (866) 597-0750. Navus Automation, Inc., is a leading full-service automation integrator. Our world-class team has a reputation for applying ingenuity to solve complex challenges and deliver customized turn-key systems solutions. From concept to completion, Navus provides robotic welding and automation systems built upon our unwavering commitment to excellence, precision, and reliability. Navus collaborates with many Fortune 500 companies in the medical, automotive, military, and consumer industries. Navus engineers are renowned for their expertise in providing innovative and solid solutions for integrated systems that increase productivity, quality, and safety. Founded in Knoxville, Tennessee, in 1998, Navus excels by envisioning the future of automation and delivering exceptional robotic solutions.